This is the ultimate collection of piano, vocal and guitar arrangements for the serious player. 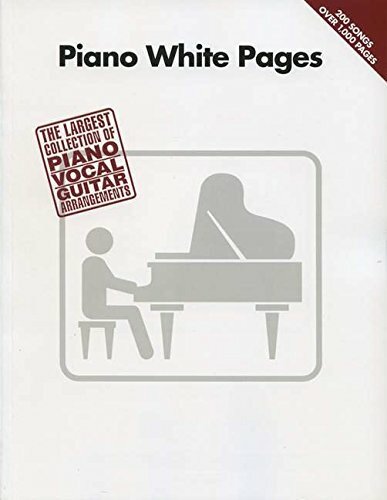 Modelled after the best-selling Guitar Tab White Pages , this new book could be the best Piano compilation of pop and rock classics ever! It contains 200 songs, including: Amazed ? Brown Eyed Girl ? California Dreamin' ? Clocks ? Come Sail Away ? Come to My Window ? Dancing Queen ? Do You Really Want to Hurt Me ? Dust in the Wind ? Easy ? Fast Car ? Free Bird ? Good Vibrations ? Happy Together ? Hot Hot Hot ? I Hope You Dance ? I Will Remember You ? I Will Survive ? Jack and Diane ? Landslide ? Oops!...I Did It Again ? Smooth ? Tears in Heaven ? These Boots Are Made for Walkin' ? Time After Time ? Walking in Memphis ? Werewolves of London ? You Can't Hurry Love ? You've Got a Friend ? You've Lost That Lovin' Feelin' ? and many more.